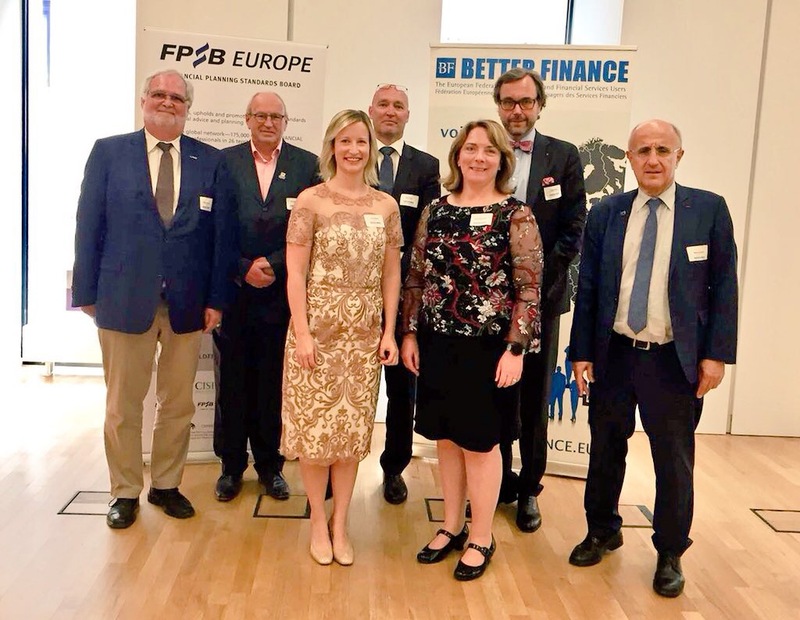 BRUSSELS – 3 JULY 2018 – The eight European member organizations of Financial Planning Standards Board (FPSB), owner of the international CERTIFIED FINANCIAL PLANNER certification program outside the United States, supported efforts to improve financial education and literacy and build consumer protections into automated advice today as a lead sponsor of the international BETTER FINANCEconference, held at the Hessian State Representation in Brussels. The conference focused on investor empowerment in the digital age, and explored how regulators, professional bodies, financial services firms and consumer groups can make a difference in the lives of EU citizens. The conference consisted of two panel discussions. Kate Holmes, CFP, Director of Stakeholder Engagement at FPSB, moderated a discussion on how the fintech revolution can empower EU citizens as savers and investors. A second panel delved into ways to empower individual investors to make better choices. BETTER FINANCE, the European Federation of Investors and Financial Services Users, hosted the one-day event. FPSB manages, develops and operates certification, education and related programs for financial planning organizations to benefit the global community by establishing, upholding and promoting worldwide professional standards in financial planning. FPSB demonstrates its commitment to excellence with the marks of professional distinction – CFP, CERTIFIED FINANCIAL PLANNER and CFP Logo mark – which it owns outside the United States. FPSB has a nonprofit member organization in the following 26 territories: Australia, Austria, Brazil, Canada, Chinese Taipei, Colombia, France, Germany, Hong Kong, India, Indonesia, Ireland, Israel, Japan, Malaysia, New Zealand, the Netherlands, the People’s Republic of China, the Republic of Korea, Singapore, South Africa, Switzerland, Thailand, Turkey, the United Kingdom and the United States. At the end of 2017, there were 175,573 CFP professionals worldwide. For more, visit fpsb.org.